When I was a kid, one of my favorite TV shows was Lou Grant -- the Mary Tyler Moore Show spinoff about the staff of a daily newspaper in California. Each week the reporters got involved in dramatic situations that looked like a lot of fun. I was also a big comic book reader, and my favorite character was Superman's girlfriend, Lois Lane. She juggled romance with the man of steel and a career as a crime-fighting, time-traveling newspaper reporter -- and she looked fabulous while doing it. I understood that real-life journalists didn't have quite the same experiences these fictional characters did, but pretty early on, I decided I wanted to follow in their footsteps. Fortunately, journalism was also the "family business," so it wasn't difficult to get started. When I was 15, my parents owned a weekly local newspaper in Coffeyville, Kansas, called The Village Vanguard. It was a mom-and-pop-and-son operation. We all performed various tasks, and besides being the main paperboy (tossing papers onto lawns from my dad's Chevy Citation), I was also the man-in-the-street reporter. I'd approach people in the parking lot of the local Wal-Mart, and ask a burning question like "What makes Christmas special for you this year?" I took their photos, wrote up their answers, and just like that, I was a professional journalist. I went on to study journalism in college -- first at Coffeyville Community College, where I was editor of the Coffeyville Collegian; then in Manhattan, Kansas, at Kansas State University, as the features editor for the Kansas State Collegian. After college, for a while I stayed in Kansas, where there weren't many media-related jobs. I was managing editor of a couple of livestock publications -- The Arabian Horse Express and International Exotic Livestock & Wildlife -- but by 1994, I realized if I ever wanted to write about something besides horses and llamas, I'd better get out of the Midwest, so I moved to New York City. I worked steadily as a freelance editor and desktop publishing specialist, and eventually I took a full-time job at BBDO Advertising, working on one of the biggest ad accounts in the business: Pepsi-Cola. I enjoyed my work at BBDO, but I missed the magazine-office atmosphere, so after a year I left the agency and went to Ziff-Davis Publishing as Assistant Managing Editor of Computer Shopper magazine -- which was weighing in at 1,200 pages a month while I was there. I moved within the company to work at FamilyPC magazine, as Copy Chief, then like a lot of New York journalists, I got caught up in the dot-com frenzy and went to work for a website. I left there in less than a year, returning as a freelancer to a branch of Ziff-Davis that had been purchased by CNET Networks, and opening my own photography studio in Tribeca. For a few years, I divided my time between managing special issues for CNET (including two issues of The Fortune/CNET Tech Review in association with Time Inc.), and working in my photo studio. My health took a downturn in October 2002, necessitating a semi-retirement. I've been battling colon cancer, and the effects of chemotherapy have made it impossible for me to handle nine-to-five office work, so I now concentrate my creative energies on writing and editing. 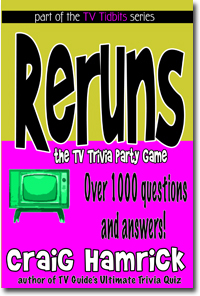 My next book, Reruns: The TV Trivia Party Game, is scheduled for a February 2006 release. 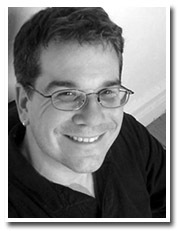 Click here to read about the books I've written and to read a few of my essays. Articles have been published in more than 50 magazines and newspapers, including: TV Guide, Soap Opera Weekly, Computer Shopper, FamilyPC, The Gateway Guide, Arabian Horse Express, Bit & Bridle, Equine Images, Exotic Animal News, U: The College Newspaper, Llama Banner, The Music Box, Superintendents Only, etc. 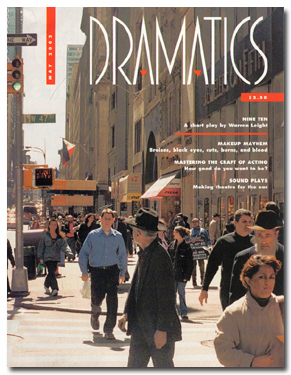 Photography has appeared many magazines, including: Fortune/CNET Tech Review, Dramatics (cover, pictured below), HX, Next, Unzipped, Gateway Guide, Computer Shopper, CNET Digital Living, and in the books Dark Shadows: Return to Collinwood, In the Shadow of the Towers, Kiss Me Kill Me (cover and interior illustrations), and The Power of Halloween (cover). I've written several books about the TV classic Dark Shadows. To read about why Dark Shadows is an important part of my life and career, Click here. 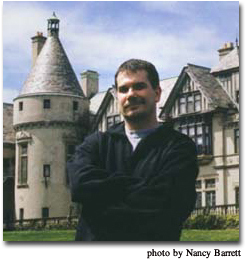 This photo was taken at Seaview Terrace, the house used for exterior shots of Collinwood on Dark Shadows. Read more about the show at my authorized DS site: Dark Shadows Online.